Anika saw Daksh leaving in the van and runs after him. Anika is running behind the van. Gauri says Anika’s phone isn’t connecting. Sahil’s mom says, she has knowingly switched off her phone, Nikhil asks Anika’s family that what was so urgent that Anika left her shagun function. Sahil’s mom says I think something is related to Shivaye. Gauri says she just works there. Sahil’s mom says call Shivaye and ask him, she is there. Gauri says stop talking rubbish, Anika works so hard for them. Daksh asks the men to keep cupboard in the storeroom. Anika thinks ‘ where is Payal ‘. Daksh thanks to Shivaye for helping, Shivaye says I get it, this is also your house, don’t worry. Daksh thanks him. Shivaye gets a call and goes. Anika says where has he hidden Payal. Daksh says it is costly wardrobe, be careful. Anika thinks about the Payal, where did Payal go. She has seen Payal’s cloth hanging out and says she is inside the cupboard, how will I get her out, I will have to take a risk, it’s not just about Priyanka’s life, its also about Payal and her child’s life. Shivaye says Khanna, I don’t want Anika here if she comes, your job in risk. Anika says how to go inside. Guests gossip about Anika. They refuse to wait for a longer time. Gauri says wait, Anika will be coming. The lady says who knows she will come or not. The guests leave. Sahil’s mom gets angry and Nikhil says I know where is she. He goes. Shivaye says Khanna, Anika shouldn’t come, Khanna asks him not to worry. Anika thought that I will not be entered in the Oberoi mention but Shanno halwai can go, Shivaye doesn’t want to listen, I have to become khidkitod, Anika. The lady asks where are you going, you can’t go. Anika says why I came here to go in. The lady asks who are you. Anika says I m Shanno, pedha specialist, I m halwaain… I m a lady. The lady asks her to show her face. Anika asks why shall I lift my ghunghat. Shivaye comes and asks what’s happening here. She asks why shall I tell you. He asks what. Khanna says they say Why as Chooo in Mathura. Shivaye says whatever, what’s the problem. Khanna says she isn’t showing her face. Shivaye says, whenever you dint show me your face, you can go, its a rule. She says you can lift my veil but I am telling you in advance that you won’t be able to handle my beauty. Khanna says I think she is beautiful, let me check once, Shivaye says I am not interested, you can see if you want. Anika says you see me once. He says let her go. go. He says stop, I don’t like people who don’t follow my rules if you insist on me to see your face, fine show me your face. She asks how can I show my face, I am a confectioner, your blue eyes can’t handle my beauty. He asks what does Kanji mean. She says cat eyes. Khanna says I have got a mirror, see her face. Shivaye saw her eyes, nose, lips and then the huge fake teeth. He says fine, let her go, ‘ suddenly’. He stops her. She dons ghunghat again and says I am Shanno halwaain. He says just prepare Shahi Tukda, groom likes it a lot. She says I will make it so well that he will never forget. He asks what. She says to leave it to me, see what I make. Tia asks what, you have kidnapped Payal. Daksh says there was no option. Tia asks why did you get her to the Oberoi mansion if someone knows her. He says relax, no one will know, I locked her in a wardrobe, Anika would reach anywhere else, she has been banned to enter Oberoi mansion, its safest option to keep Payal here, once I get married, I will see Anika and Payal, there can never be a problem where Daksh is there. Anika comes there. She thinks in which room is that closet kept. Tia asks who is she, what if she has seen Payal. He says I will see. Anika’s fake teeth fall off. Daksh asks Anika that who are you, are are you deaf. Anika does veil and she replied to Daksh that I am not deaf, but there are deep secrets, I m amazing, I m Shanno halwai from Mathura. He asks are you peeping inside the rooms. Tia asks why did you put long veil. Anika says nobody can handle my beauty. Tia says to remove the veil. She tries to see her face. Shivaye comes and asks what are you doing here. Daksh asks who is she. Shivaye says halwai, I have checked myself. I know you are stressed about Anika but she can’t reach here. Anika gets the fake teeth and fixes in time. Shivaye asks what are you doing here. She says I was finding the kitchen. He says I will show you, and Priyanka was finding you two. Anika asks who was that ugly man. He asks who. She says he is quite mannerless. He says the kitchen is on the right side. She asks where is your sister. He says you will get everything, else ask Khanna to get it. She says fine but that guy… He says, Anika… she worries. He says you know Anika right, she would have booked you as a halwai. She says I know her a little bit. He says if you give any info to her, I will send you back to Mathura. She says don’t worry, forget about Anika, I won’t tell anything. Rudra comes and says we decided we will put on a pink rosebud, we will start this with you. He gets Tej’s call and goes. Shivaye asks what to do. He tries to fix the rose. It falls. Anika holds it and fixes it in his coat. Shivaye looks at her. Rudra calls out and says dad wants to talk to you as well, come soon. Shivaye thinks why am I thinking about her, what happened to me. She thinks I have come to find Payal. He goes. Anika says I couldn’t find Payal, Priyanka didn’t get the letter, marriage is tomorrow and I m making sweets here. Maid gets the sweets order. Anika asks what shall I do. Maid asks who is the halwai. 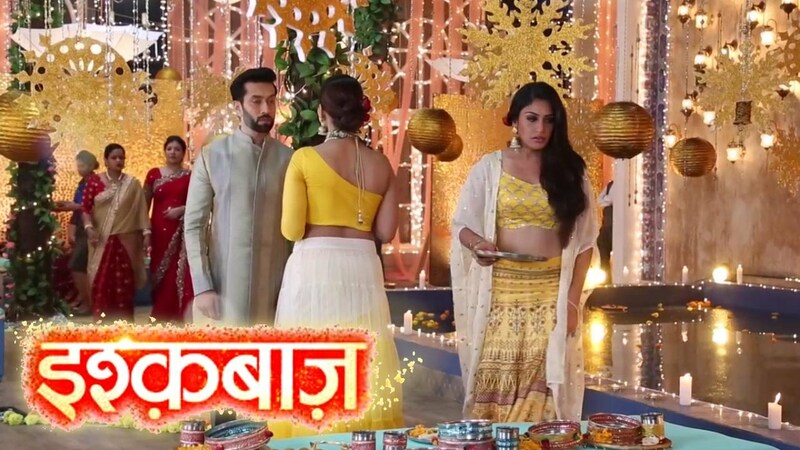 Anika says I m Halwaain, don’t disturb me, I will prepare the sweets. She says its too much, did I come to break the marriage or prepare sweets, if Daksh gets exposed, sweets will be required. She takes sweets and thinks to find Payal. Nikhil shouts Anika. He asks a guard to call Anika. Shivaye asks what’s happening, why did you come here. Nikhil says to take Anika. Shivaye says she is not here. Nikhil says she is here. Shivaye says I have fired her and ousted her from this house, why will she come here. Nikhil says if she isn’t here, then where is she, it’s our shagun today and she didn’t come home. Shivaye says I m not surprised, amazing, she wore the ring on the other hand on her engagement day, and today on shagun day, she is missing, what will happen after marriage, I mean if at all the marriage happens, she isn’t here, I m not interested to know where she is, go and look for her somewhere else, don’t raise your voice in my house again. Tia asks where is Payal. He says she is inside the almirah. Anika checks it. She opens the closet and finds it empty. Payal runs to Shivaye. Daksh catches her and takes her away. Anika sees something…..and gets shocked.